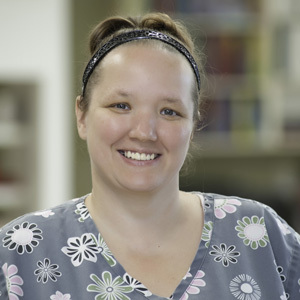 Patsy has an Associates Degree in Applied Science in Veterinary Technology from Baker College. She is a Licensed Veterinary Technician. Patsy had worked at a day practice clinic for 2 years, and had 1 year of emergency experience before joining AEC. Patsy has been with AEC since 2009. "I chose a career in emergency medicine because I love the variety of cases that we treat, the variety of species that we see, and the need for immediate action with critical patients. I strive to ensure that both my patients and their families are comfortable and have all their needs met. I truly enjoy helping an animal to get well and send them home with their family, happy and healthy". Patsy has 4 children ranging in age from 3-12 years old, an 11 year old Beagle named Jodie and a 2 year old Pit Bull named Nyla.